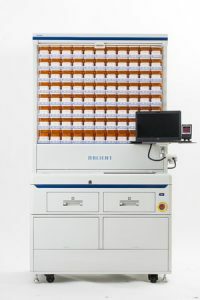 Our Calendar Pack Machine is a semi-automatic blister card filling and packaging automated solution for Long Term Care pharmacies. This technology was designed to with the pharmacist and the clinical nurses in mind. It helps the pharmacist maintain control of the filling process and maintain inventory. The accuracy of the Calendar Pack creates a smooth workflow in the pharmacy and the clinical nursing staff by eliminating errors and by ensuring the right medication for the right patient at the right time. Our cooperative company “RxInsider” newly run the article about “Yuyama” on their Website. The category is “Pharmacy Automation & Robotics”. Please check it out.